An outfit that I wore for Kiehl's grand opening ceremony last week (see my previous post). 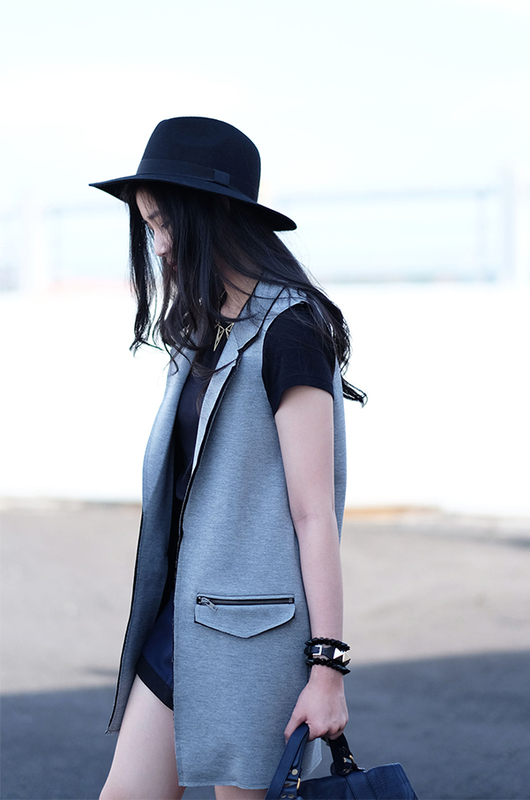 I was really excited to wear this sleeveless ponte jacket that I bought from Topshop. What I like about this jacket is that it makes a simple outfit look effortlessly chic! I wore a black t-shirt and skort to paired up with the jacket. However, I think that dark coloured crop tops or even long sleeve knit would look just as great. You can never go wrong with topshop - obsessed with that piece! This outfit is perfect! I love the skirt, the jacker, the boots, the hat, everything! the outer rocks your outfit! kindly check out my street style maybe? I looove your look here!